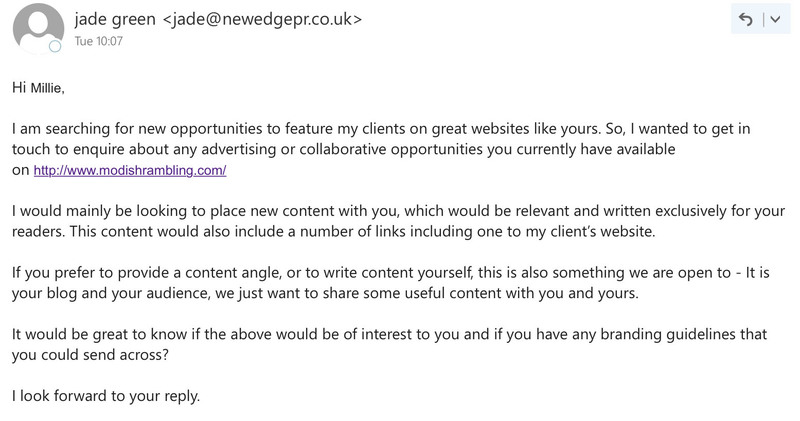 So a few days ago I received an email from a "PR company" asking if I was interested in collaborating. It turned out to be a scam. Thankfully I didn't fall for it, but it was a little tricky for me to confirm it was fake. Bloggers could all too easily fall for it, especially as there seems to be little to nothing written online about it that reveals it to be a scam. If you're a blogger, I suggest you read on. An e-mail popped into my inbox from somebody named "Jade Green" from "Newedgepr". 'She' had a seemingly legitimate e-mail address, with her name @newedgepr.co.uk etc etc.. So on the surface of it, I just thought it was an ordinary PR email. I noticed things were a little bit out of the ordinary straight away. First of all, the senders name wasn't capitalised, it was all in lower case. Receiving an email from "jade green" instead of "Jade Green" seemed very unprofessional to me. Secondly, the email was obviously a template with my name and URL in a different size to the rest of the text. Although I was a little suspicious, I just put it down to this 'PR company' being a little rude. The initial e-mail said that a well known company was seeking a space on my website, and they asked for what advertising slots I had, if I would be happy to place links, or if I wanted to write content myself. They asked me to send over branding guidelines (basically a description of my blog, who I am and what I do). Again, my concerns were raised. Why were they contacting me if they evidently knew so little about my blog? I responded, and received an e-mail back in the early hours of the morning at 5 something AM. This rang alarm bells because it suggested either a different time zone, or certainly not professional behaviour expected from an established PR firm. The second e-mail said that they weren't going to reveal who the company was and what they wanted me to do until I had agreed that I would not be disclosing that I, or any potential blog post, was sponsored or endorsed. The second they started stating conditions like this, and were being so hesitant I knew this wasn't real. But I had to get my suspicions confirmed. I looked on their website (see here) for some kind of suggestion that it was fake, but it looked like a very legit website. It looks professional, they have a phone number, social media links etc. I looked at their social media and guess what? Next to no followers, next to no posts, and no recent activity. They hadn't even tweeted since 2015! So by now everything's adding up. But what exactly was the aim of their scam? To see which bloggers are the most gullible? I knew there had to be some kind of financial gain. 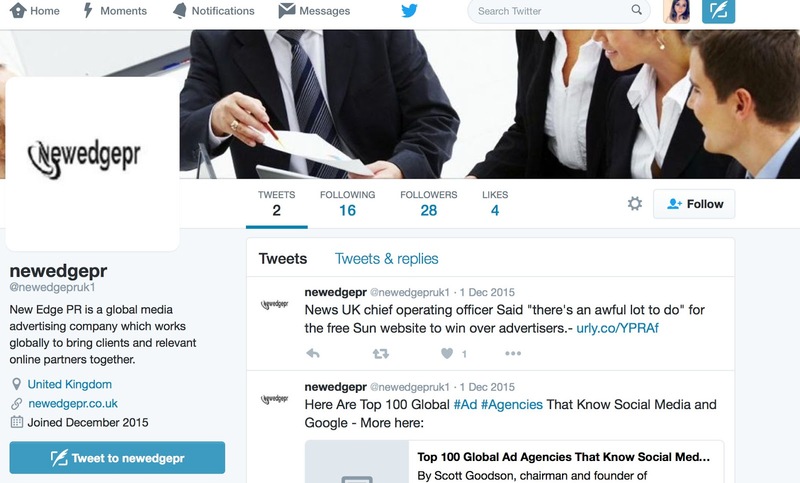 So I simply went onto twitter, typed in @newedgeprUK1 and looked at users who'd mentioned them. 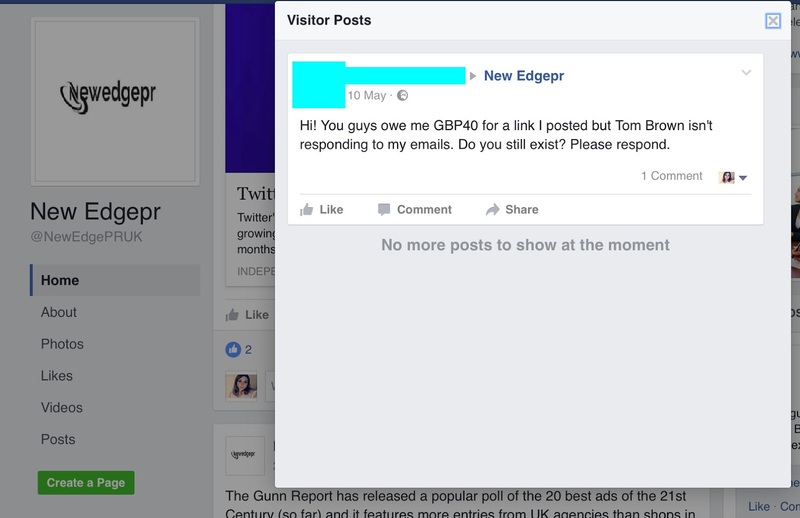 Lo and behold, people were complaining about not receiving their money in compensation for posting links. I also saw this on their Facebook page. So I didn't even reply. I hope this scam doesn't go very far, but unfortunately there are many young bloggers, or people who are naive or maybe just too trusting. As I said, no evidence came up in any search engine that this was fraudulent, so I felt I should write something solely about them. In a world where blogging is booming, con artists must be cottoning on by now to how young people are starting blogging, and how eager bloggers are to get some PR attention. Please approach PR email as you would all emails, just because it says it's from a PR company, doesn't mean it is. If you get an email from a 'prince' in Nigeria offering to send you money if you do X Y Z, you wouldn't do it. Please carefully consider if 'PR companies' are essentially the same as all those princes with wealthy inheritances they just want to share with you. Good luck to all those with prospering blogs, and receiving positive PR attention, but please approach with caution. Thanks a lot for this very useful post. This Jane just contacted me and just told me the same things. I know that is fake now. It confirmed what I thought. Thanks a lot again. No worries lovely. Like I said, when I googled it nothing came up! Hopefully this post will surface in search engines so people like you and I having doubts can easily find out more information. Yep, i'm a young blogger and i got an email from this "jade green" today as well. exact same one actually, as others have said, i googled the name of their site, checked out their social media and yeah my suspicions were at an 8/10 by this point. then after googling "newedgepr scam" i found this and my suspicions are 20/10. Thanks. i suppose we can report their emails. gonna do that. Just got one today and I am so glad I read this! Same email! Hi, Thank you so much for posting this. I just received an identical email from Tom Brown! Needless to say I won't be collaborating! You're welcome! When I first google searched New Edge BS - sorry I mean, PR! all that came up was their website. I searched again yesterday out of interest and I'm so thankful this post is now on the top searches! And I mean genuinely thankful for the trouble I've saved people. Ahhhh, so glad I read this as I've just received an email from said "PR", stating / requesting exactly what you received in your original email!! Will block & delete. Oh, the name that contacted me was a "David Clarke". Thank you for writing this post. I just got an email from "tom brown" with the same email asking to collaborate. It's always a red flag to me when a "pr company" doesn't want to disclose the brands that they represent. Thanks for spreading the word on this- they e-mailed me yesterday! Even us oldies can get suckered in! Just discovered your email, only put up a post for them two days ago - radio silence and no payment since, so it's come down straight away. It was pre-written content, so I didn't waste my time with it, but still very blooming annoying! I am actually contacting the brand who they said they were representing as it's really annoyed me!! Thanks for writing this up! 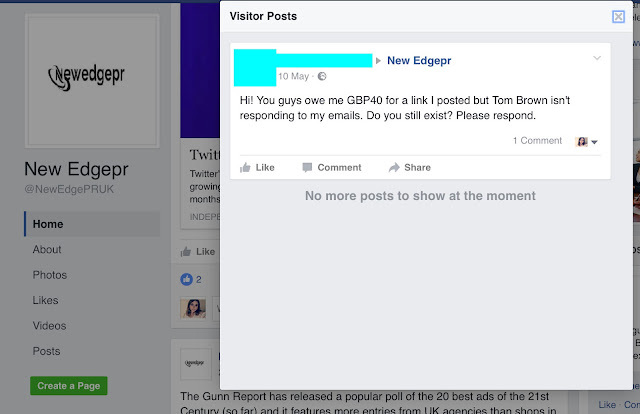 Update to this - I took down the post, let them know, and I was paid. Thanks for this. They emailed me a few days ago with a very unprofessional email, so I googled and found this site. Won't waste my time replying. Thanks again! Thank you for this. I've recieved an email this morning. I thought it was dodgy as soon as i read it. Thank you for sharing this - I've had a couple of emails from them now, both from different people. Luckily I got a feeling that something wasn't right about it, but also did a bit of research and came across your post, which has confirmed my suspicions. It's terrible that these scams even exist, and if they're using other brands names in the process then I really hope they get found out soon. Hopefully by posting this more bloggers will come across it when they do their research! OMG! Thanks so much for this post! Just received an email from them and instantly googled! Thank you for sharing this and support! It is very useful. They reach out to me and prior to replying did some research. Just want to say a massive thank you for making this post. I have been receiving PR emails here, there, and everywhere the last while, and I have never gotten them before as my blog is still small. This was one of the first ones I received and it was fishy enough. I didn't know what to think! I just really didn't like how vague and scathing the emails were. I have been replying with really specific questions, but not getting any answers. I had done some research, but never found anything on them. I decided to research again, and found your post. Thank God. I really appreciate it! 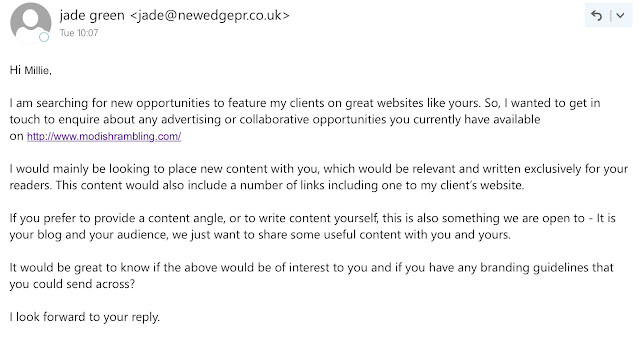 I won't be replying from now on...Do you have any tips as to what an actual PR email should look like? I don't know who to trust now, I have some similar emails in my inbox, but they are not as badly presented as the emails from these guys (the difference in font - obvious template). Oh my! Thanks for this post. I just got an email from Laura Wood. 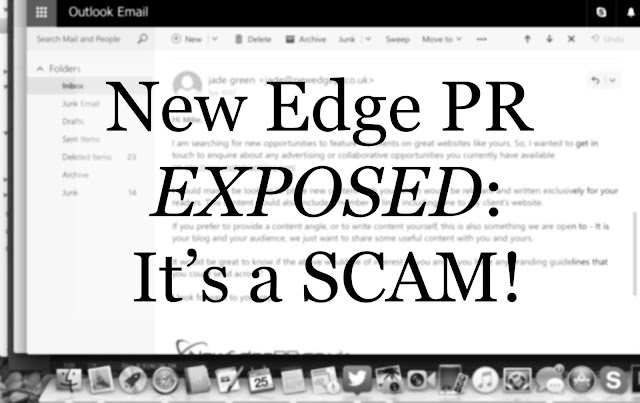 googling New Edge PR scam now brings up your page :) Shared with a blogger FB group. Thank you so much for this! Wow I wouldn't have known had I not Googled them just to make sure, I was just about to take them up on their offer. Ugh but thankfully I found this post just in time. Seriously thank you so much, you saved me.